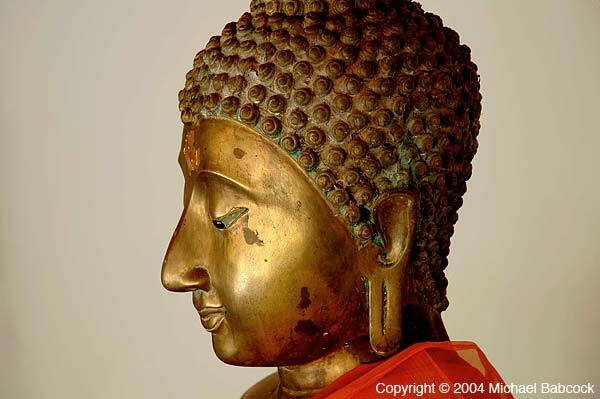 – Ajahn Chah, in Being Dharma, p. 113. Kasma tells me that Thai people traditionally didn’t eat sweets for desserts; if they had a dessert at all, it was fruit of some variety. Something sweet might be eaten an hour or so after eating or it might be eaten at any time during the day. This is not so different from how the Thai people treat food in general; for instance, they don’t really have any specific breakfast foods. Breakfast is considered just another meal and anything that is eaten at any other time of the day will also be eaten for breakfast. Thai markets are full of khanom – I’m actually fairly amazed by the variety of Thai desserts and snacks. On our market walks we’re always seeing something that I swear I’ve never seen before. They are part of what I think of as a “grazing culture” – a Thai will eat any time of the day or night. 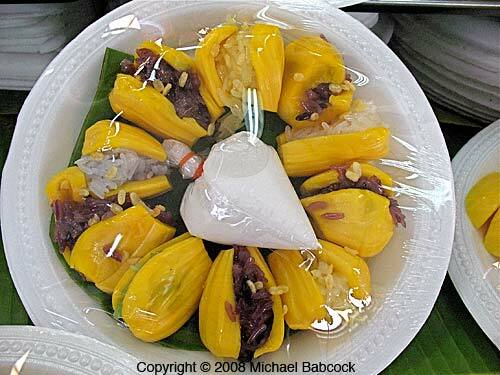 Sometimes these new snacks don’t last – the sticky rice treats in jack fruit pictured here appeared one year at Aw Taw Kaw (Or Tor Kor) Market in Bangkok but the next year they were not there. Too bad, they were tasty! The Tapoica Black Bean Pudding is representative of Thai sweets in many ways. One, it includes a salty component. Two, it is coconut based. 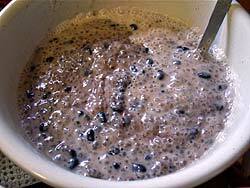 Three, it contains ingredients that are healthy for you (black beans, coconut milk). 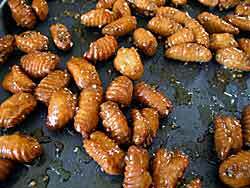 Thai sweets and snacks are seldom just sweet and, as a rule, are less sweet than American Desserts. They often have a salty component to play off the sweet taste. 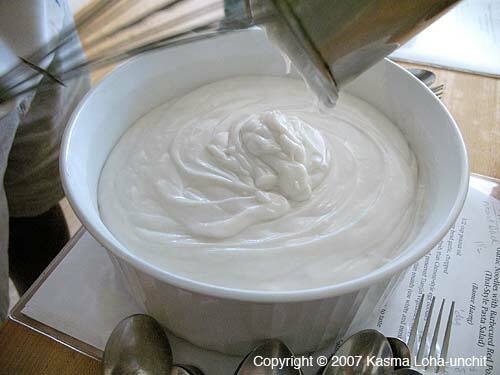 Kasma was very amused a few years back when the New York Times ran an article about the “new” way of making desserts that included a salty component. She wrote a letter and pointed out that in Thailand and all over Asia they’ve combined sweet and salty for hundreds of years. Another characteristic of Thai khanom wan is the presence of healthy ingredients – coconut milk, taro, squash, corn, to name just a few. Coconut milk is actually a very healthy food indeed, despite the efforts of the American oil industry to convince us otherwise. I’ve written an article The Truth About Coconut Oil and perhaps the best article on the subject is Coconut: In Support of Good Health in the 21st Century by Mary Enig, Ph.D. We’ve also got a page with numerous links to information about coconut oil. The quick story is that coconut oil does not clog your arteries or contribute to heart disease and it is full of healthy fats, such as Lauric Acid and Caprylic Acid, which have a beneficial effect in the body by helping you fight off bacteria, viruses, parasites and fungus. It is what is called a “functional food,” defined thus: “a functional food provides a health benefit over and beyond the basic nutrients.” (See Coconut: In Support of Good Health in the 21st Century by Mary Enig). Coconut milk is also used in other desserts, such as Khanom Tuay – Steamed Coconut-Rice Cakes in Small Dishes and Sticky Rice and Corn Pudding (Kao Niow Bpiak Kao Pohd). 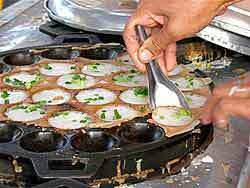 And of course the khanom krok mentioned above. Southern Thai-Style Sweet Roti (Muslim Fried Bread) sprinkled with sugar and condensed milk and/or stuffed with sliced banana). 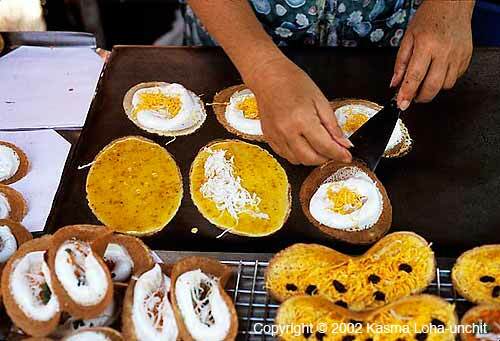 Although these originated in the south, you’ll find roti vendors all over Thailand. 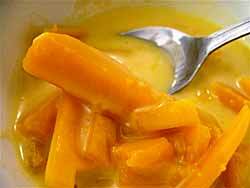 Another type of sweet you may encounter has a bright orange appearance, the color coming from egg yolks. One example of this is Khanom Buang Thai, a Thai crepe whose filling includes meringue and sweetened egg yolks. 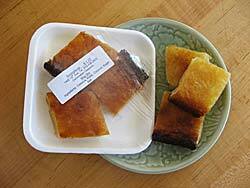 These particuler snacks can be traced to the influence of Marie Guimar, the half-Japanese, half-Portuguese wife of a Greek minister (Constantine Phaulkon) to the Siamese royal court in the 17th century. Marie worked her way to the position of head of the royal kitchen and introduced the use of eggs in making desserts and other sweets. One trend that I’ve noticed over the years is an increase in western-style desserts in Thailand. 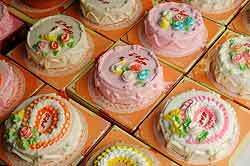 It is fairly common to see bakeries that have decorated cakes and there’s one restaurant chain, S & P, that is famous for their cakes. In markets and malls you’ll find cookies, cakes and donuts. 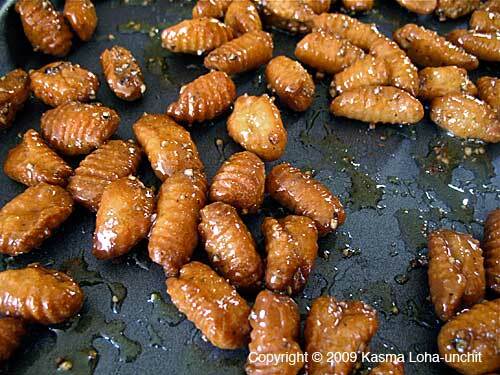 And there are the exceptions to Thai snacks being less sweet than western desserts. 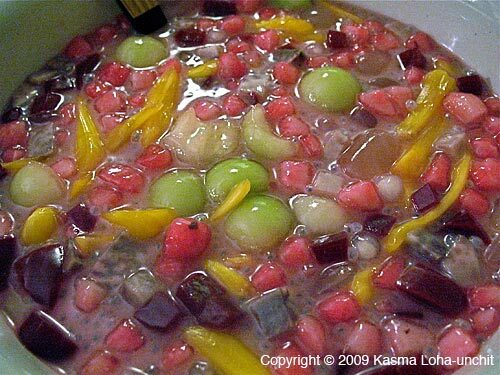 On one memorable evening, a Thai friend took us to a trendy khanom shop that served nothing but extremely sweet, multi-colored syrups on white, puffy bread. I suppose the western-style bread makes this a fusion dessert. The place was absolutely packed. In the United States, I’ve not seen much of a variety of Thai snacks at Thai restaurants: you’re lucky if they have sticky rice or fried bananas. Where I’ve seen a greater variety of snacks, somewhat more representative of what you find in Thailand, are at some of the Asian markets we frequent, such as Mithapheap market on International Boulevard an 14th Street in Oakland. You’ll find the snacks by the check-out counters. If you’re not in the Bay Area, make a trip to some of the Southeast Asian markets in your area. (See Shopping at Asian Markets (for Thai Ingredients). 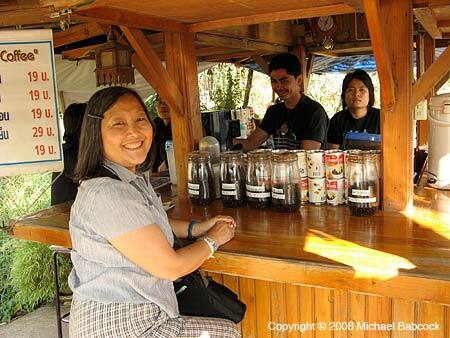 We’ll finish with this picture of a young woman vendor outside of Worarat Market in Chiang Mai. 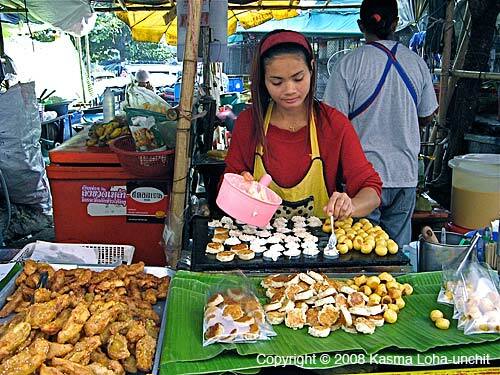 She’s making Grilled Coconut Cakes (Khanom Paeng Jee), Fried Yam Balls and Fried Bananas (Gluay Tawd). If you want to eat Thai khanom your best bet is to travel to Thailand and be adventurous in the markets. 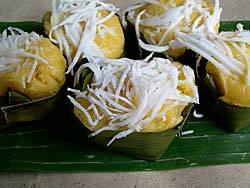 If you want to learn to make khanom you can do so in Kasma’s classes. Written by Michael Babcock, October 2009. 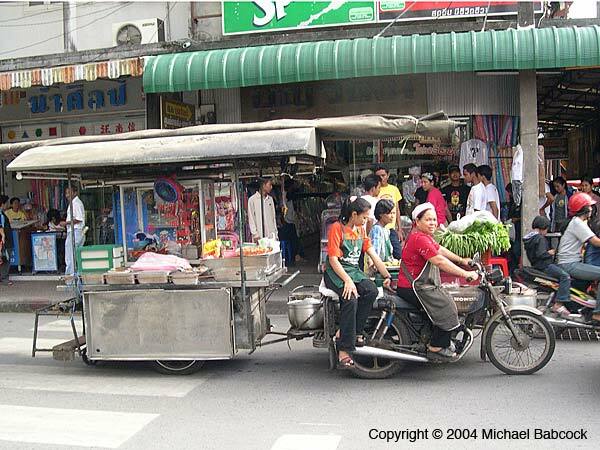 This picture was taken on the streets of Nakhon Si Thammarat and gives a good sense of how some street vendors move their operation from home to a selling location. I saw this go past on the street, ran almost a whole block and snapped it just as she was about to pull away from a red light. 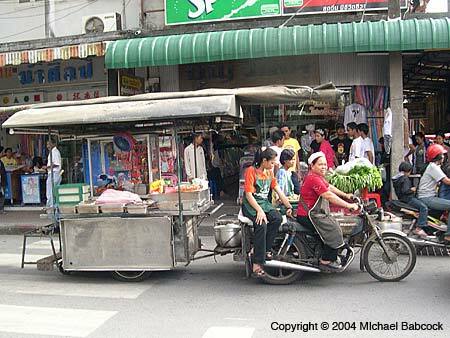 This vendor has it fairly easy and gets to use a motor cycle to move her operation; others are not so lucky and pull them along by hand. The tapioca pudding in Thailand is quite different from what westerners are used to. Traditional wisdom in the Orient tells us to eat foods in accordance with the elements of the season in order to stay healthy. In the hot season, we eat milder and lighter foods, such as clear soups, oil-less sour salads and leafy greens, and drink cooling teas like those made from chrysanthemum flowers and pennywort leaves. In the cool season, our diet shifts to include richer and spicier foods like curries, coconut soups, and creamy coconut custards and puddings. 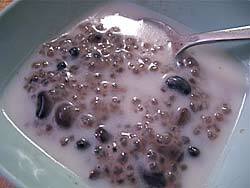 Among the puddings I so loved as a child are those made with tapioca pearls swimming in a warm coconut milk soup. They sometimes contain other flavor and texture elements such as starchy black beans or barley, crunchy water chestnuts, smooth creamy strips of young coconut meat, chewy sticky rice, or sweet corn kernals. These puddings warm the tummy and calm a child’s restless spirit on cool winter evenings. 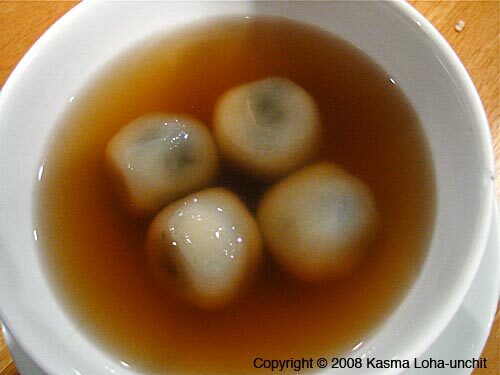 At the same time, they are nutritious, easy to digest, and relatively light compared with dairy-based western desserts. 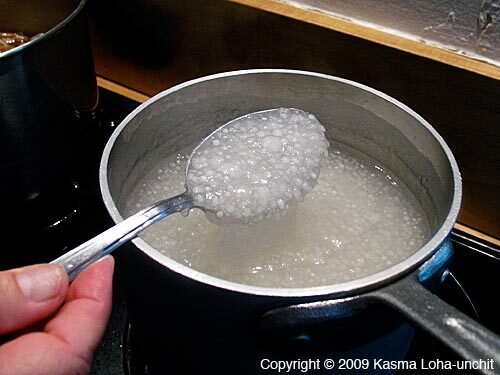 In most of Asia, tapioca pearls and the puddings made from them are called sagu, sago or sakoo – derived from a Malayan word for the sagu (pronounced “sah-koo”) palm tree (Metroxylon sagu). The sagu palm grows naturally in swampy areas of tropical Asia and is believed to have originated in the Molucca islands of Indonesia. From there, the palm found its way to the rest of Southeast Asia and to India. This 12- to 17-foot palm in the same family as the coconut palm lives for about fifteen years, after which it dies standing. During its decline, a shoot sprouts from the underground root to produce a new tree which carries on the life of the dying parent. Since ancient times, natives on the islands of Indonesia have used the dense starchy core of the dead sagu palm’s trunk for food. The starch is made into small pellets and dried in the sun so that they can keep until needed for cooking into both savory and sweet dishes. A very common preparation is to cook the starch into a thick porridge and mix with sweetened coconut milk to make the age-old pudding that is now enjoyed throughout Indonesia, Malaysia and the rest of the Asian subcontinent. Before rice cultivation was introduced in the fifteenth century, sagu was an important staple carbohydrate food on many of the islands in the Indonesian archipelago. Even today, the southeastern islands of the chain where sagu palms grow abundantly continue to rely on it, especially during seasons when rice yields are insufficient to feed the populations. A full-grown tree can yield as much as 600 to 800 pounds of starch for consumption. 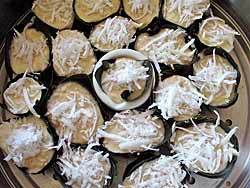 Besides the starch, the fruit of the sagu palm makes a good snack; the leaf fronds, like those of the coconut palm, are valuable thatching material for roofs; and the fibrous, peely bark can be woven into mats for use as siding for homes, into flat trays for drying foods and into storage baskets. 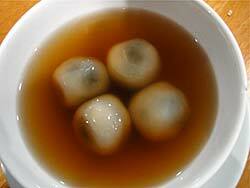 It is believed that sagu as a food has been around for over a thousand years. In his explorations of the Spice Islands, Marco Polo encountered and sampled it, and later, in the booming international maritime trade of the eighteenth century, sagu was among the prized commodities from these islands, favored especially by Chinese merchants. Even western merchants in those days became intrigued with sagu and brought it to their homeland where sagu pudding soon became a popular dessert. Though sagu palm starch is still used to make puddings, it has been replaced in much of Southeast Asia by the starch from the manioc or cassava root, which grows prevalently, take much less time to mature and are easier to harvest. Most of the tapioca pearls imported into America today are made from the latter. 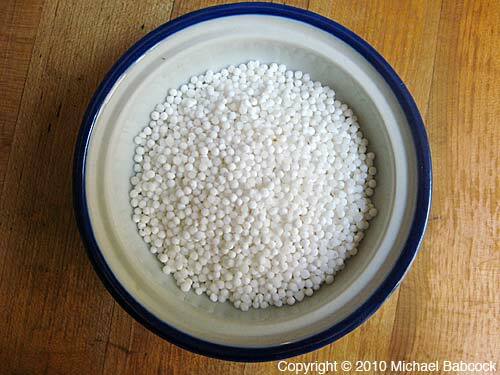 In Southeast Asian markets, they come in tiny round pellets in a choice of white, light green and purplish pink. The colors are natural –– the green from the fragrant juice extract of pandanus leaf and the pink from the lovely purple flower of a tropical vine called anchan. Occasionally, you might encounter a mixture of louder colors like bright orange and red, which are from artificial food dyes. Use the small pellets for the following recipe. 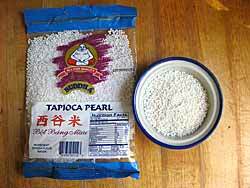 For a more substantial, chewy texture, try the larger pearls the size of fish-eye pupils in the first recipe, or use it in savory soups for both an interesting visual and textural component, as well as a source of carbohydrate. This recipe is also available on our website as Tapioca Black Bean Pudding. Pick through and discard any shriveled beans. Cover with water and soak for two or more hours. Written by Kasma Loha-unchit, October 2009. This picture shows Kasma at the National Museum in Songkla, a southern seaside city on the Gulf side of Thailand. The museum was originally the governor’s mansion and is well worth a visit. Even on very warm days, it’s cool inside. The picture on my computer desktop rotates every day and I’m always glad when this picture appears. 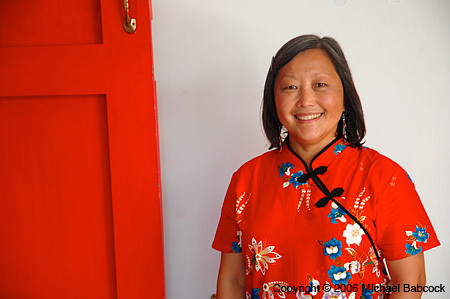 You are currently browsing the Thai Food and Travel Blog blog archives for October, 2009.